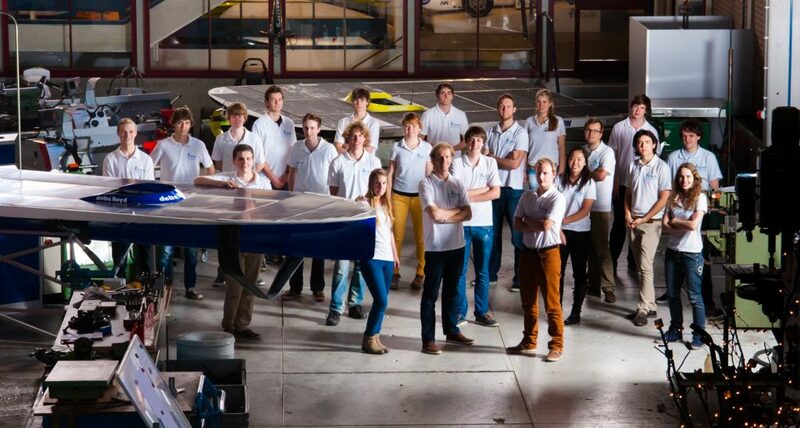 What is the TU Delft Solar Boat Team? The TU Delft Solar Boat Team is a Dreamteam that is situated in the D:Dreamhall. The name of this hall is an acronym for: ‘Delft: Dream Realization of Extremely Advanced Machines’. In the D:Dream hall multiple student teams work on their own innovative projects. Our team exists out of 28 ambitious students of ten different faculties from the TU Delft. In one year the students of our team take up the challenge to design, produce and race with a fully functioning solar-powered boat. 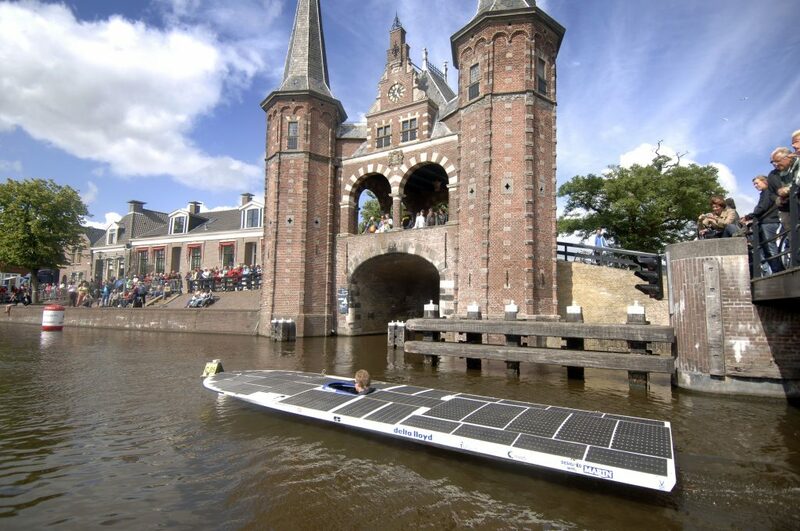 In 2005, the first TU Delft solar boat broke boundaries by winning the ‘Frisian Solar Challenge’. For the next five years we’ve been gaining expertise on designing and producing the most efficient solar boats. In 2010, we’ve improved the efficiency of our boats even more by implementing hydrofoil technology for the first time in the competition. The hydrofoils lifted the entire hull out of the water, thereby reducing the drag significantly. Our first hydrofoil configuration consisted of both surface piercing and fully submerged foils. In the following four years our expertise on foiling technology expanded continuously. In 2014, the next big step was made. For the first time in the history of the ‘Dutch Solar Challenge’, two fully submerged foils were used to lift the hull out of the water, reducing the hydrodynamic drag of the foils. The boat flew on its two foils much like a bycicle, remaining stable due to its forward speed. For the next four years our knowledge on control theory and simulation grew considerably. This year, we are looking forward to our next big step: developing a seaworthy solar boat. Team 2006This is the first boat that the TU Delft Solar Boat Team built for the first edition of the Frisian Solar Challenge. They managed to win the race with a significant difference from the number two. Team 2008In 2008, the team managed to win the Frisian Solar Challenge with a lead of three hours compared to the number two using this boat. The boat has a very narrow under water ship (10 cm deep), reducing the drag of the boat drastically. This design proved to be very popular: after 2008 various teams have rented our mold to manufacture their very own solar boat. Team 2010In 2010, the team first started with the implementation of hydrofoils in the design. 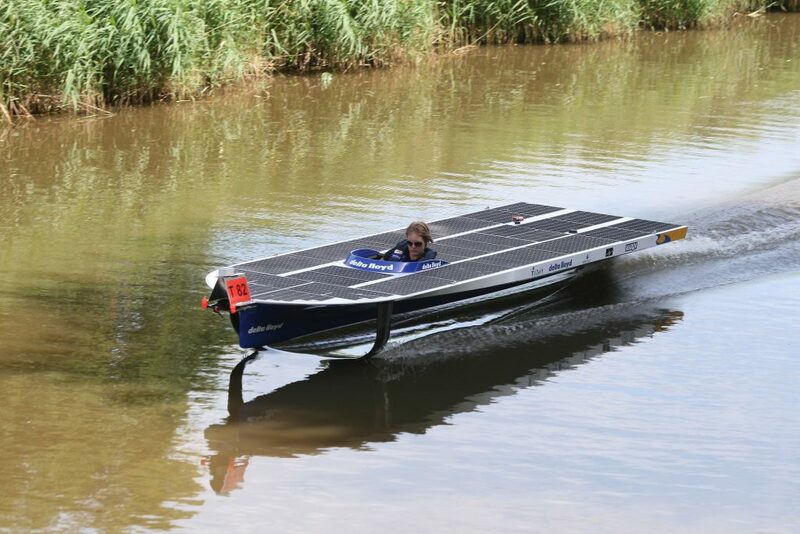 With this boat, they obtained a third place in the Frisian Solar Challenge 2010. The hydrofoils lift the hull of the boat out of the water when the right speed is reached. This reduces the boat’s drag dramatically, allowing it to reach one and a half times as high speeds as the 2008 boat using the same amount of power. 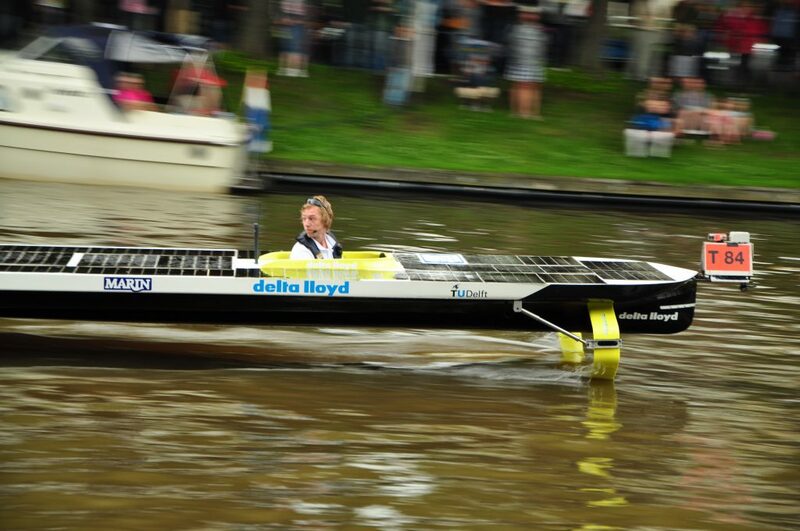 Team 2012In 2012 the team, under the name of Delta Lloyd Solar Boat Team, again managed to develop a boat that can hover above the water at different speeds. The boat uses hydrofoils which lift the hull out of the water. At high speeds, the angle of attack of the hydrofoils is adjusted, which reduces the lift and stabilizes the boat. Team 2014With this boat, the team turned a lot of heads at the DONG Energy Solar Challenge: it was the first boat ever to have a double T-strut hydrofoil configuration. The boat only has two points of support in the water, which gives him along with aeroplane-like characteristics also bicycle-like characteristics. Team 2015The team of 2015 used the boat which was made in 2014 and improved it. They mainly worked on the drivetrain. 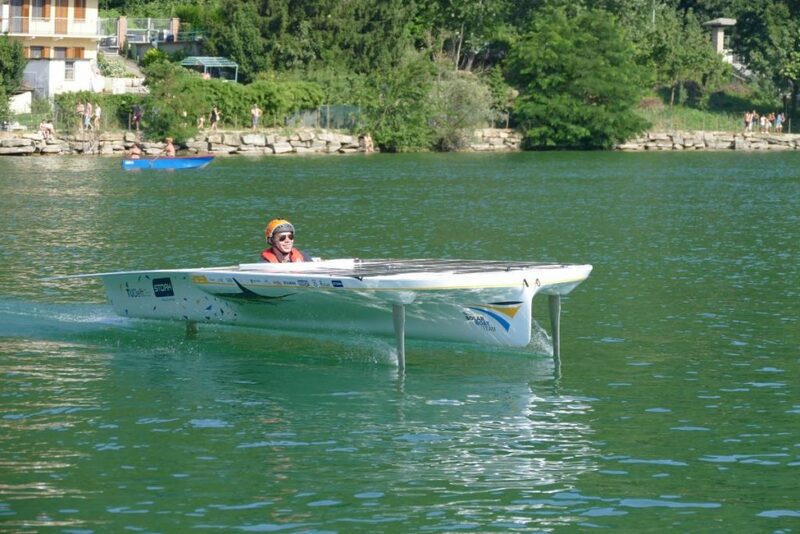 Because of their improvements the 2015 Solar Boat was able to go at a speed of 51 km/h. 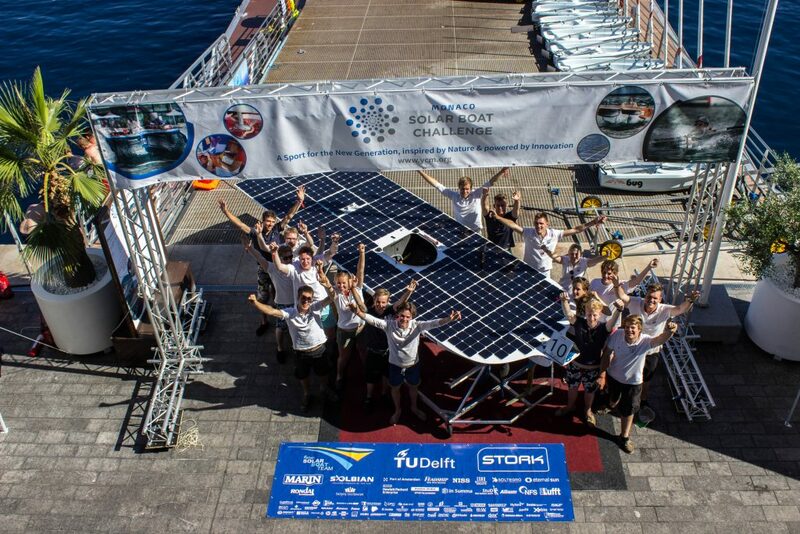 In 2015, the boat obtained a third place in the Solar1 Cup and won the design award at the DONG Energy Solar Challenge. Team 2016The team of 2016 completely redesigned the hull of the boat and improved the wings. Because of this, the boat was able to achieve the speed of 55 km/h, which is the highest speed yet within the team! This year the team participated in the Dutch Solar Challenge, in which they managed to achieve second place. 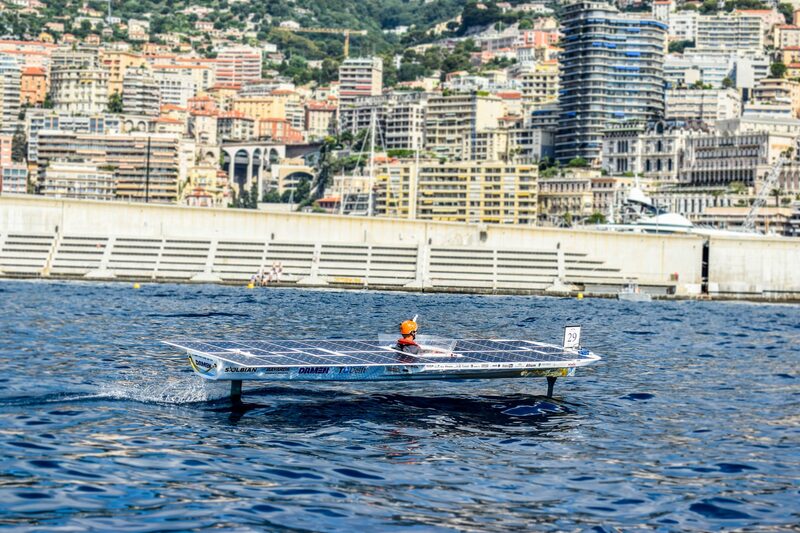 The team also participated in the Monaco Solar Boat Challenge in which they achieved an overall second place in the ranking and were awarded the Riva Beauty Award. Team 2017The 2017 team has increased the boat's maneuverability and stability by designing a boat with three hydrofoils. 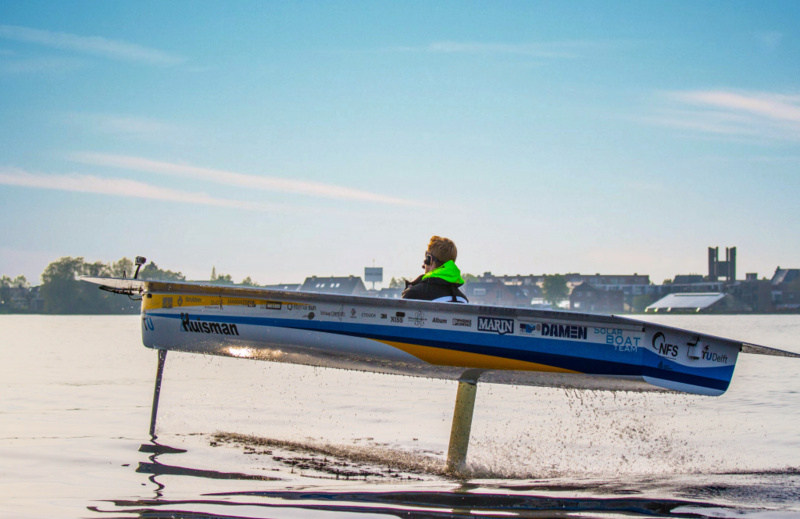 Despite the extra hydrofoil and bigger hull, the boat has reached a top speed of 48 km/h This year, the team participated in the Monaco Solar Boat Challenge. Furthermore, the team wanted to cross the English Channel. Unfortunately, this crossing had to be canceled due to the high risks at the time and safety matters. Team 2018The 2018 team chose to use double T-strut configuration once again. With this speeds of 50 km/h were reached. Because this boat could steer with both the front- and the backstrut it was both manouvrable and efficient. In the Solar Sport One competition they won the second prize.